Today, the Maryland legislature successfully overrode Governor Hogan’s veto of a bill granting Maryland workers access to paid sick days at long last. Coalition group Working Matters estimates that nearly 700,000 workers who previously lacked access to paid sick days will no longer have to choose between their health and their job. While inaction on paid sick days at the national level continues to erode families’ economic security, a group of cities and states are stepping up for working people and serving as models for jurisdictions throughout the country. Maryland is the latest example and the ninth state to guarantee a minimum amount of paid time for eligible workers to care for themselves or their family when they are sick or need medical care. Roughly 32 percent of the private sector workforce in the United States has no ability to earn paid sick time. Furthermore, access to paid sick days has historically been far more common among high-wage workers, leaving low-wage workers and their families with little protection when they get sick or need to visit the doctor. This important legislation not only protects workers from lost pay or potential job loss when they or their family members get sick, it also protects the public by keeping sick workers, who feel economically compelled to work, from spreading illness to co-workers and customers. In a paper released last year, we highlighted some of the costs to workers and their families when they are not given the opportunity to earn paid sick time. By examining estimated spending on essential items for families who lack paid sick days today, we quantified how this lack threatens the economic security of low- and moderate-income families. As the figure below shows access is vastly unequal in private sector—that’s why we need federal action. The highest wage workers are more than 3 times more likely to have access to paid sick leave than the lowest paid workers. 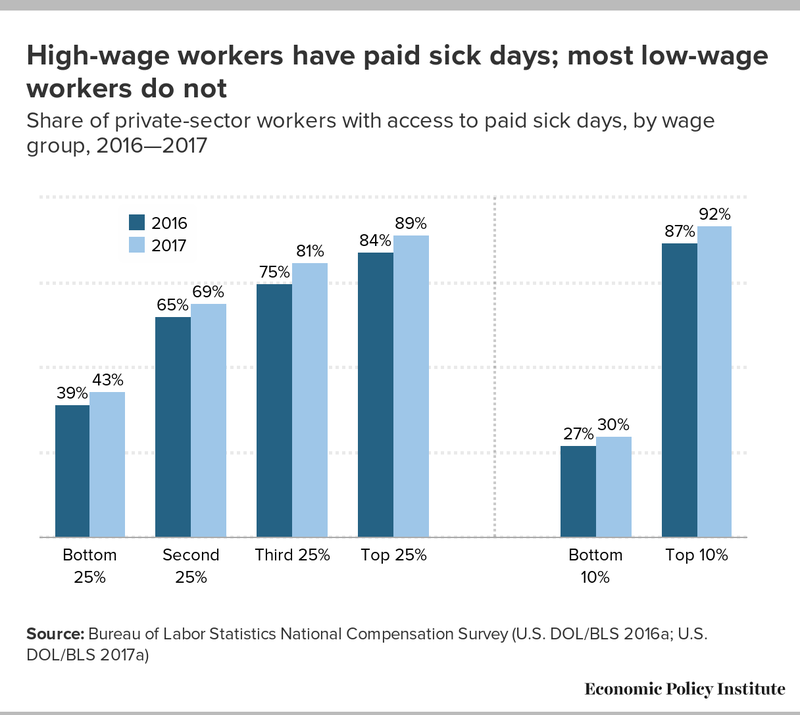 Whereas 92 percent of the highest wage workers had access to paid sick days, only 30 percent of the lowest paid workers were able to earn sick days. In this way, access to paid sick days increases with wages among workers, disproportionately denying workers at the bottom this important security. Meaningful paid sick leave legislation is incredibly important for low-wage workers and their families, the vast majority of whom do not currently have access to paid sick time. Not having paid sick days means millions of workers feel forced to go to work when they are sick, where they are less productive and more prone to mistakes. The ability to earn paid sick days lets working people cover their expenses and pay their monthly bills, even in the event of illness. This income security allows workers to rest, get the health care they need, and fully recover from an illness before returning to work. While any new labor standard generates concerns about the business climate and job creation, the large preponderance of evidence from jurisdictions that have legislated earned paid sick days has been positive. This research was summarized in EPI testimony in the Maryland Senate and House in recent years. Fortunately, successes at the state level appear to be increasing coverage. The figure above illustrates across-the-board increases in access to paid sick days over the last year. While we applaud Maryland legislators for extending this access to the nearly 700,000 Marylanders who would otherwise be unable to earn paid sick days, the problem calls for a national solution—providing paid sick days for workers across the country, regardless of their wage level, their hours, or the state they live in.